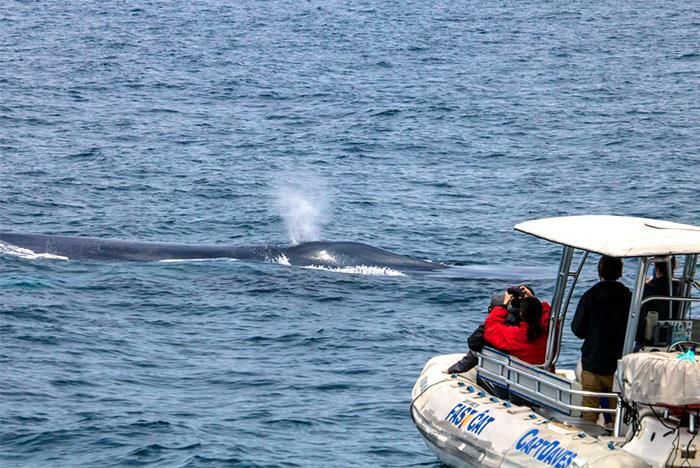 Grab your camera and binoculars and be on the lookout for dolphins and whales! 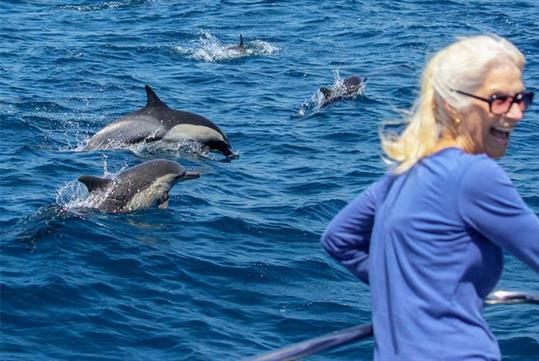 This narrated ocean excursion will teach you about Dana Point’s abundant marine life, from sea lions to birds and more. 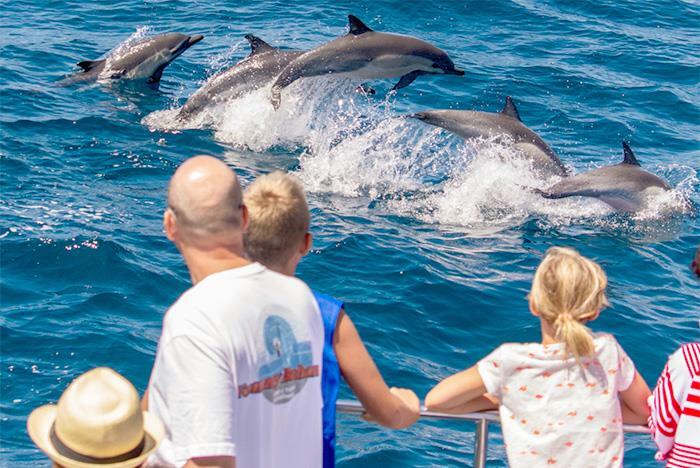 Take advantage of the ship’s Eye-to-Eye Underwater Viewing Pods to see what it’s like to swim along with dolphins. 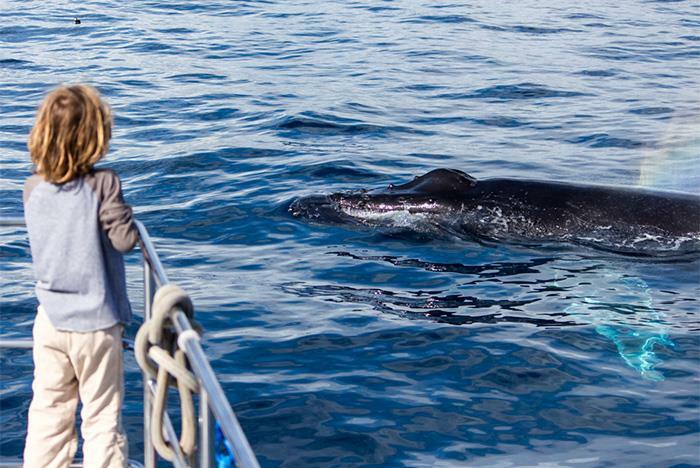 Listen to the hydrophone to also hear whale and dolphin vocalizations! Offers a stable ride and up-close wildlife viewing. Features Eye-Spy Trams Nets, Underwater Viewing Pods, micro-museum, and more. Tour duration: approximately 2.5 hours. Fun for families of all ages. Includes a covered cabin area for protection from the elements, two bathrooms, and cushioned seating. 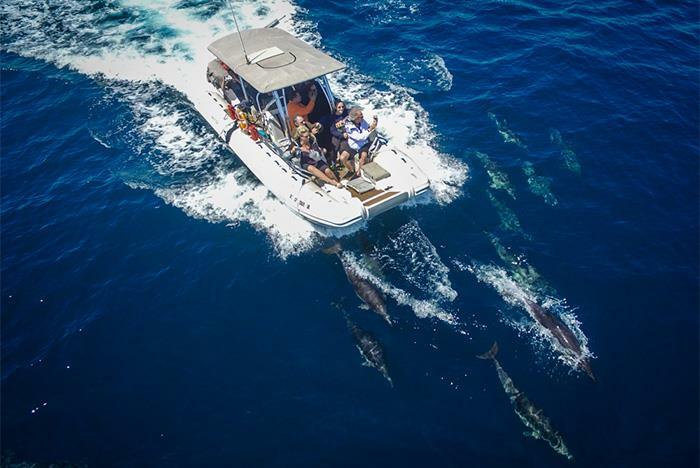 The Dolphin & Whale Watching Safari accommodates up to 49 passengers per trip. 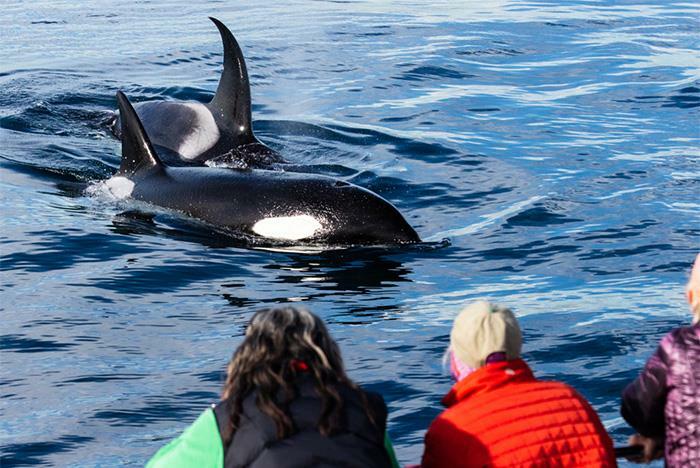 The Zodiac tour accommodates up to 12 passengers per trip. 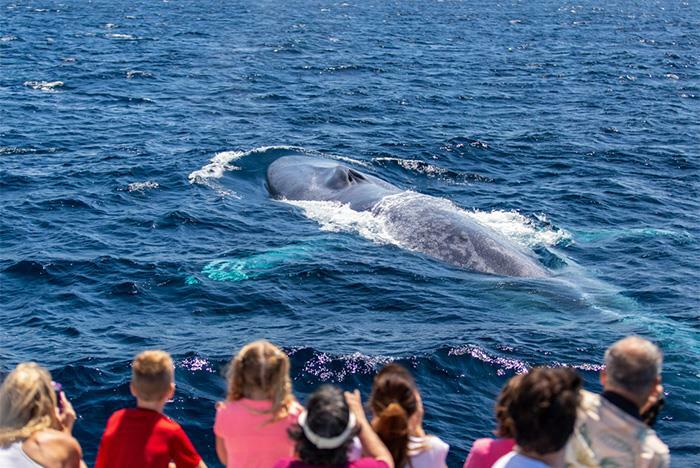 During this narrated tour, you'll learn more about Dana Point's year-round magnificent whales, dolphins, sea lions, sharks, birds, and more. 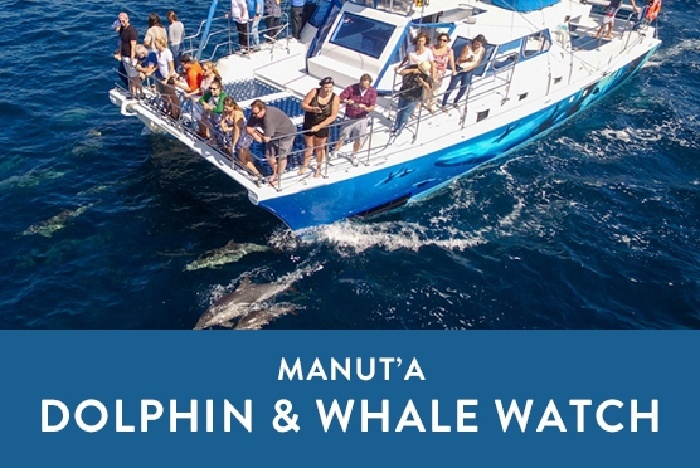 Manute’a (pronounced mah-noo-tay-ah) is the primary vessel used for our daily whale watching trips. 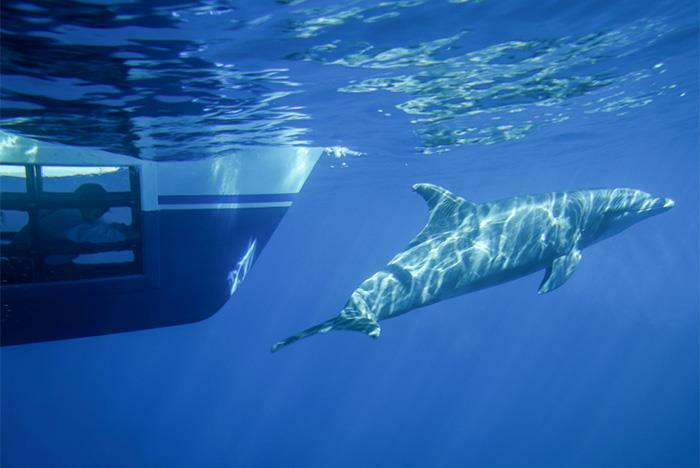 This high-tech, high-speed catamaran sailboat offers the world’s most unique dolphin and whale watching experience. Manute'a features Capt. Dave's exclusive Eye-to-Eye Underwater Viewing Pods. The two "Pods" give you the extraordinary experience of feeling what it's like to swim with dolphins and whales, underwater, without getting wet! 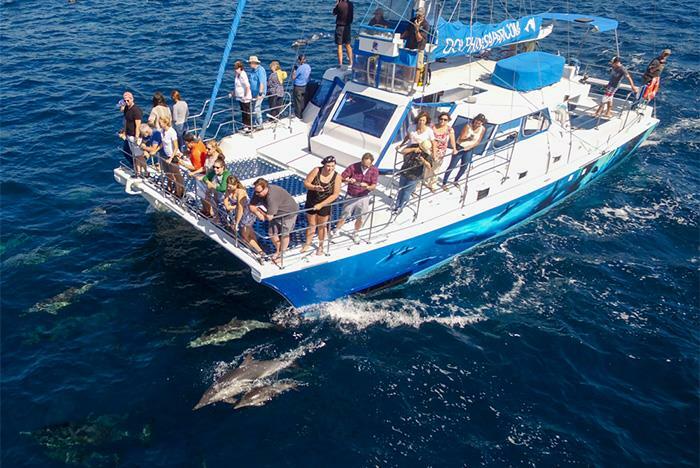 This vessel also features a hydrophone to listen to dolphin and whale vocalizations, three Eye-Spy Dolphin Tram Nets on the bow for an up-close and immersive whale watching adventure, and a micro dolphin and whale museum. Never crowded, Manute’a carries up to 49 happy passengers with plenty of elbow room and comfortable seating for all. The Fast Cat is our upscale zodiac (rigid hull inflatable catamaran) perfect for adventurous types seeking a small group tour that will have you incredibly close to the ocean’s surface and within arm’s reach of wildlife. 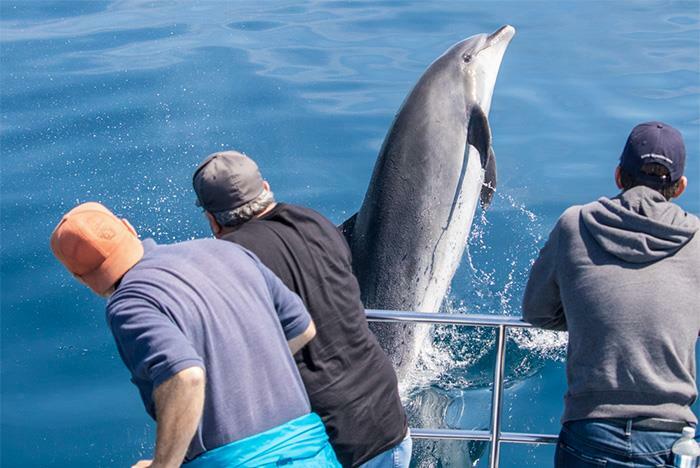 Grab your GoPro and hop aboard this fast and fun dolphin and whale watching excursion, with up to 12 passengers, for an intimate 2-hour look at Southern California’s year-round whales and dolphins. With speeds up to 30 knots, you’ll spend less time looking for animals and more time enjoying them! U. S. Coast Guard inspected and certified for safety. Features heavily padded seats and large sunshade. During this narrated tour, you'll learn more about Dana Point's year-round magnificent whales, dolphins, sea lions, sharks, birds, and more. And Mrs. Capt. Dave’s legendary, delicious Triple Fudge Brownies are served! 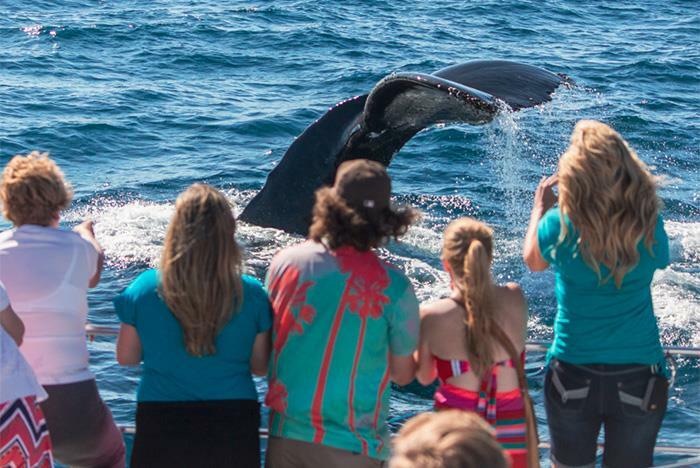 When is the best time of day to see whales and dolphins? There is no specific time! Dolphin, whales and all types of marine wildlife float, freestyle, glide, pose, dive, dip, and zip throughout the year, all day long. Morning trips are calmer because there’s less wind, and disruptions in the water are easier to spot. How far in advance should I check in? We recommend 30 minutes ahead of time. 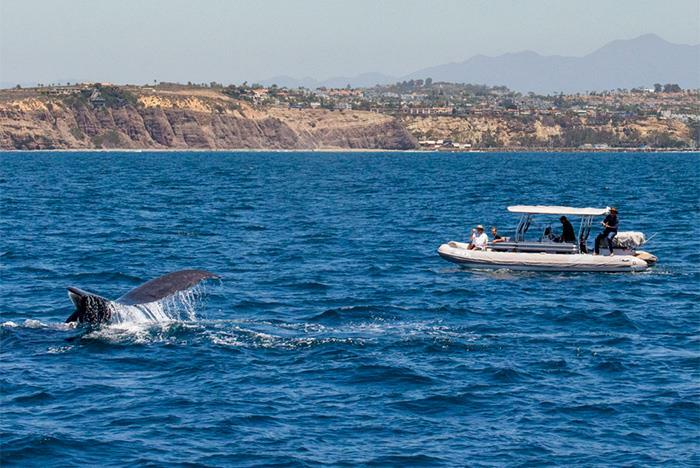 Between June – September, we suggest arriving 45 minutes in advance to ensure parking ease at Dana Point Harbor. If it’s a holiday or Festival of Whales, please allow one hour because whales tend to double park. You’re welcome to bring beer and wine on our 2.5-hour Signature Safari, but for safety, please don’t forget the plastic cups. And as always, drink responsibly. You can also visit the Dolphin Deck where you can purchase cold beverages, delicious sandwiches, yummy snacks and refreshing ice cream. Guests should bring sunglasses, cameras, (or extra space on the smartphone), film or memory cards, binoculars, sunblock, small children, caps, and visors. Jackets and windbreakers are always good, too. Because this vessel offers a fast and bouncy ride, plastic bottle beverages that can be closed and easy-to-eat dry snacks that won't be swept away by the wind, such as granola bars or cookies, are recommended. To prevent spills please do not bring open cans of drinks. It is usually 10-15 degrees cooler on the water, even when the sun shines, so it’s a good idea to layer clothes. Wear tennis or deck shoes if possible, preferably with non-marking, non-black soles. And if it looks like rain, a rain poncho will help. A hat or visor is a good idea, too. Yes! The Manute’a has two bathrooms. The bathrooms are slightly below deck so you need to be able to climb down a small boat ladder – just three steps – to get to them. How far out to sea do you go? 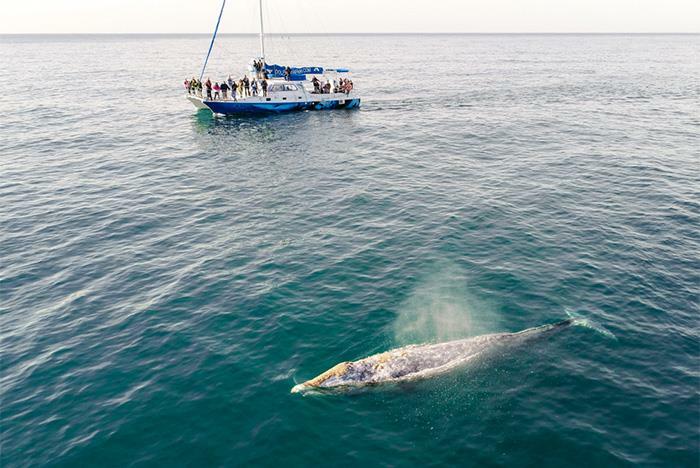 Our vessels usually go out about 3-5 miles, but we have gone up to 8 miles from shore on occasion, depending on where the whales and dolphin are. We are always in view of the gorgeous Orange County coastline. What should I do about seasickness? Bonine, Dramamine, Ginger tablets. Ginger Ale and Pressure Point Wristbands are all available for purchase on the Dolphin Deck, but check in early to ensure maximum effectiveness. What happens if it rains or gets foggy? If it’s safe, we go! And although it rarely rains in Southern California, your captain will make a decision as to the safety of the voyage before departure if it does. Be prepared, at the dock, and ready to go! 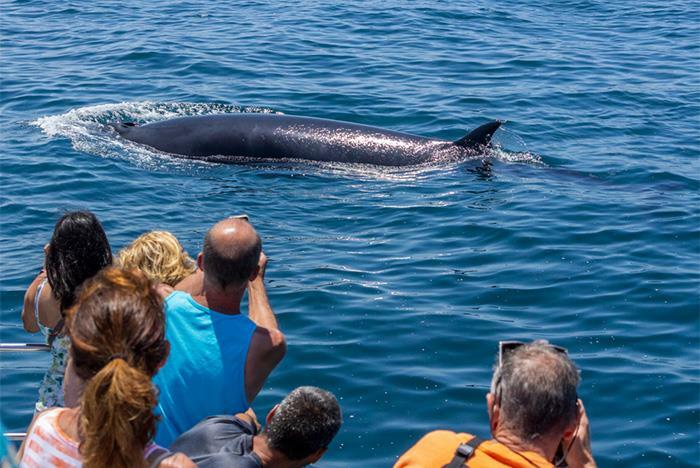 What if we don't see whales or dolphins? In the unlikely event your safari turns up zero whales or dolphins, you can return for FREE within one year from the date of the trip! IMPORTANT: Your “no sightings” ticket is non-transferable and expires one year from the date of your “no sightings” safari. Please use your free ticket before the expiration date! Do you allow pregnant women? Children of all ages are welcome aboard our boats. All of our vessels are safe and certified by the U.S. Coast Guard. Can I bring someone who is in a wheelchair? Will I get wet on the boat? 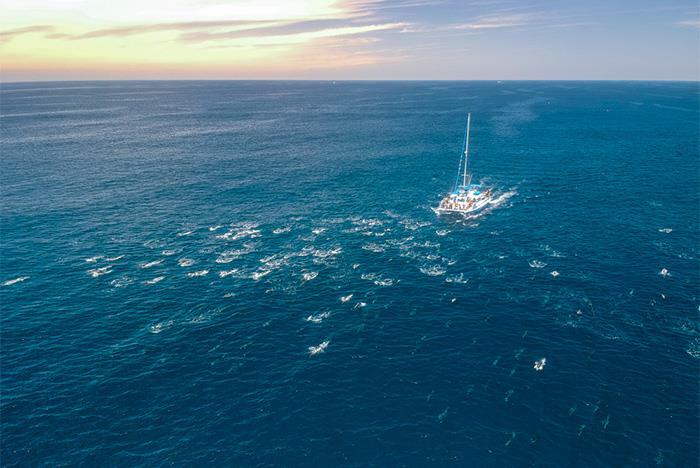 Depending on ocean conditions, your legs and feet could get wet on the bow while the boat is out to sea and going fast! 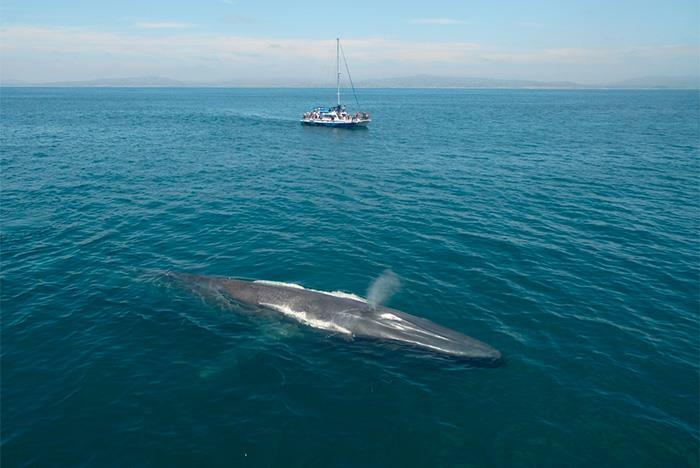 However, the boat slows down in the presence of dolphins and whales and you’re less likely to get splashed. Should I tip the captain and crew? Only if you would like to, and please know it’s never expected. 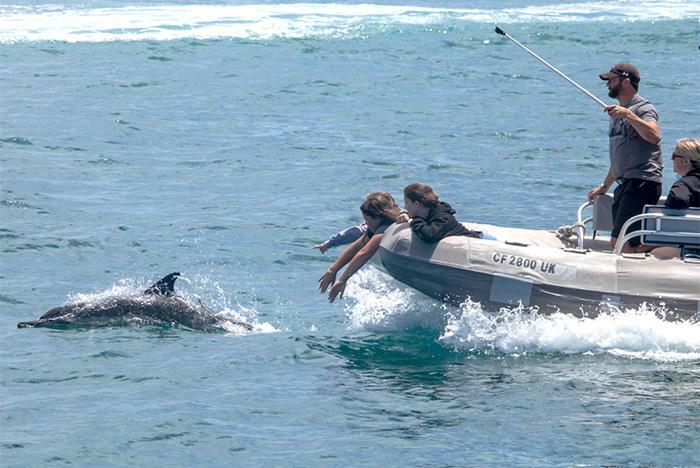 If you have enjoyed your whale and dolphin safari, gratuities are always appreciated. How many people can the boats accommodate? 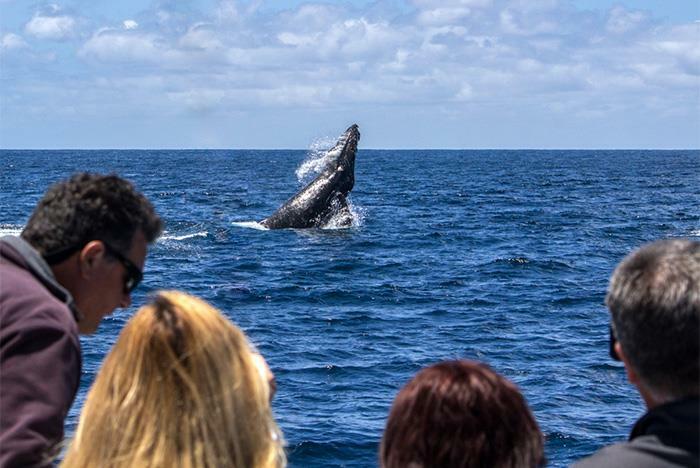 The Dolphin & Whale Watching Safari holds a maximum of 49 passengers per trip and the Zodiac tour can accommodate up to12 passengers per trip.